I just discovered Coding Relic, which is a really great resource. I really enjoyed your article from last November on Foursquare. Etc, etc. The rest of the email suggested that I write a post about the client. Unfortunately the truth is he did not just discover this blog, in reality he has no idea of its existence. 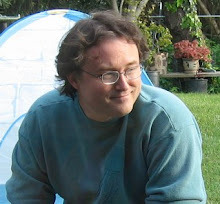 He supplied a list of keywords to an automated tool which searches Technorati/IceRocket/BlogSearch/etc to send an email to those with contact information available. One of the keywords was "foursquare," and it found the one solitary article I wrote which matched. This email was generated by a bot. It is given an initial direction, which it uses to autonomously pursue a goal. The goal in this case is to generate blog posts about the client. I've chosen not to write a blog post about the client as it is not related to the topics I'm interested in. Instead, I'm going to write about the bot. Email spam bots should top the list: harvest addresses, send spam email, repeat. Twitter bots will follow, wait a few days for reciprocation, then unfollow in an attempt to build a large follower count. If you do follow back they generate a generic "Welcome and thanks for following my tweets!" message. Hype generation bots, which retweet anything containing a keyword. Google Alerts, which inform you when a site matching specified keywords is crawled by Googlebot. Email spam filters like spamassassin. Services like socialtoo block dangerous tweets, such as those containing a link to malware or a phishing site. We're still in the early days of networked bots vying for and against our interests. The attacking bots so far have been mostly unfocussed, broadcasted out widely in hopes of catching someone. We're just starting to see the rise of targeted malware, coded with information about the specific person(s) it is trying to reach. The offense is learning tactics and strategy. The defense needs to step up its game. Defensive bots now are specific to particular communications media, monitoring twitter or email or telephone. We're moving to a world where your online presence actively monitors communications channels you use, actively defending your interests. There is another good bit of advice from the world of sports: You can't win by playing defense. Many useful tools to actively monitor things you are interested in are free, and easily available. Anyone can use them, not just marketing and PR firms. One which I use is Google Alerts, a service by Google to monitor the web index for search terms you specify and email any new results. You can choose to be notified immediately, or to batch results together for a full day or week. You can also choose whether to monitor the entire index, or only specific venues like videos or blog search. 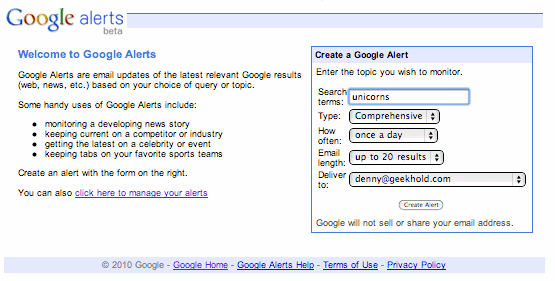 I use Google Alerts to keep track of my online presence, I want to know what the search results for my name will be. "You never get a second chance to make a first impression" is as true now as it ever was, but now the first impression is often formed via a web search for someone's name.